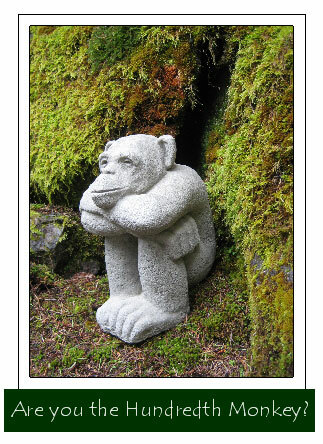 The "100th Monkey" story is told by Lyall Watson in his book Lifetide. It's an account of scientists studying Macaque monkeys on the Japanese Island of Koshima. Every day, scientists delivered sweet potatoes to the sandy shores of Koshima Island. The Monkeys of the Island in turn ate the sandy potatoes. One day, the scientists observed a little monkey go to the ocean and begin to wash away the sand before eating. From that one monkey the idea spread. Days later, the young monkey had taught its mother to do the same, and from them others learned. Soon a group of 100 monkeys joined in. After this 'tipping point', the whole colony was regularly washing their sandy potatoes. Take this story to heart, and think about climate change. At what point will there be enough people aware and concerned about our planet that a tipping point of our own will be reached? Are you eating sandy potatoes? 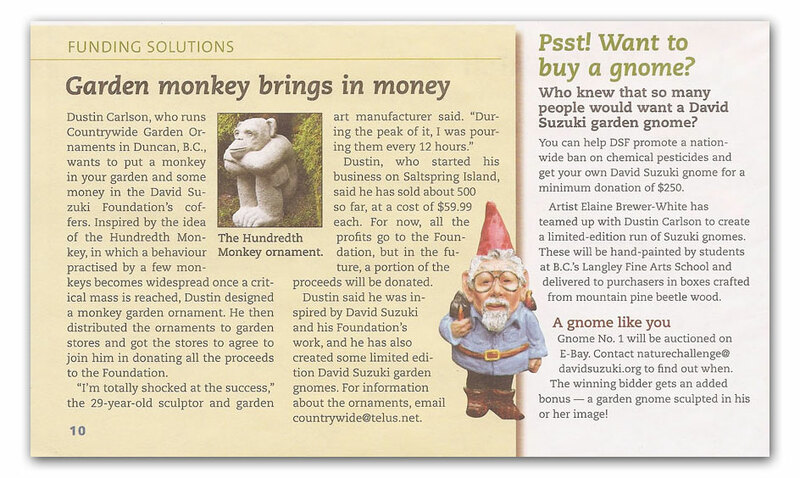 100% of the funds received from the purchase of this monkey will go directly to the David Suzuki Foundation. Feel good about helping the planet. We are all one step closer to the solution. Your new garden companion is an eternal reminder that together we can reach our goal of sustainability within a generation.